Directions to the University of Dayton and an interactive campus map can be found in the Related Links at the bottom of this page. 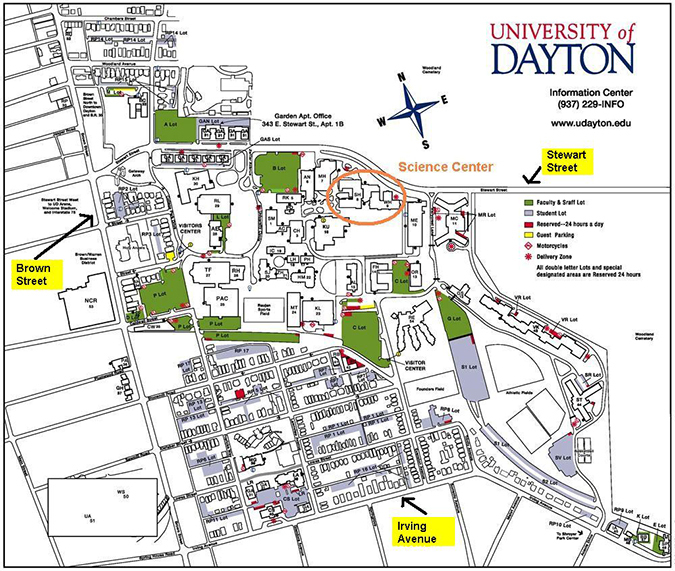 All events will take place in and around the Science Center, marked in orange on the map below. It is wheel-chair accessible, and there are elevators and accessible restrooms in the entrance hall. The main entrance to the Science Center is on the south side of the structure. We will post signs inside the building directing you to the registration desk and to the rooms where the sessions take place. You can park in any UD parking lot marked with a single letter (i.e. A, B, C, etc.). These lots are shaded in green on the map below.